For this years Scottish meet we stayed near Lochinver in Sutherland. 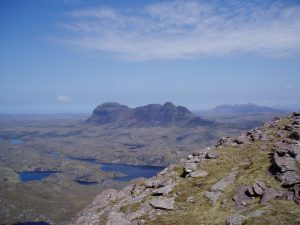 Excellent location for Ben More Assynt, Suilven, Quinag, Sail Gharb and a myriad of lochans and wee hils + other Corbetts. What a fabulous week – sun every day, with Lochinver twice being the hottest place in Europe! Lots of great walks and swimming in the sea at Achmelvich.